By Susan Larson. Photos © Robert A. Martin, for Fredericksburg.Today. Local law enforcement joined more than 100 officers and deputies from around the Commonwealth at the “Back the Badge” appreciation luncheon at the Fredericksburg Expo Center on November 15, 2016. The event was co-sponsored by State Senator Bryce Reeves (R-17), himself a former Prince William County narcotics detective and former U.S. Army Ranger. He currently serves on the Courts of Justice Committee in the Virginia Senate. “The Senator wanted to hear what Virginia law enforcement needs, as well as how leaders in Richmond can work with them to keep Virginia safe,” Reeves’ Revitalize Virginia PAC Communication Director Sam Azzarelli said. Reeves is considering a campaign for lieutenant governor in 2017. 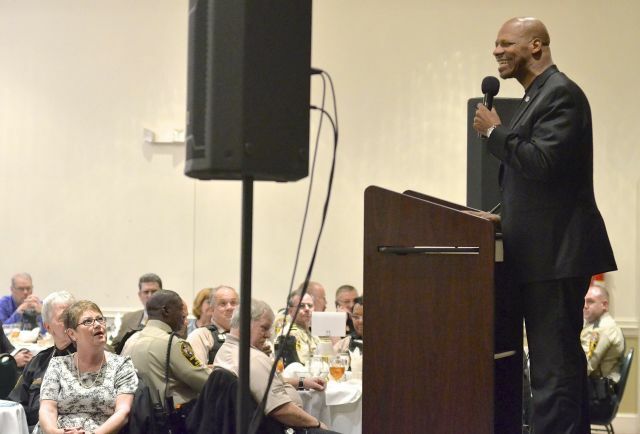 Steve Fitzhugh, a former NFL player with the Denver Broncos, was the guest speaker at a luncheon. Back the Badge is an organization that encompasses support for those who voluntarily put their lives on the line for their community.